Here is, finally, my first contribution to the Tour del Gelato, brainchild of Sara of Ms. Adventures in Italy–and from what I’ve been reading in the blogosphere, my timing isn’t too bad as it seems many of you in the US could use a touch of relief. To my readers enjoying cooler weather, I’m jealous, but at least I have gelato! Today’s destination today is actually a place I’ve mentioned in a previous post (Eating Out in Calabria), and it remains my favorite gelateria (place where they make gelato, of course) around here. 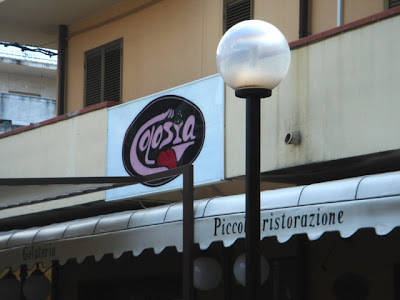 It’s appropriately called “Golosia,” which means something along the lines of gluttony or greed in Italian, and it’s been holding down a well-trafficked corner of the SS 106 (Calabria’s version of California’s Pacific Coast Highway) in Gioiosa Ionica Marina since 1989. There are 32 different flavors in the gelateria section, but they also make cakes, pastries, cannoli, and torrone di mandorle–an almond nougat that’s shipped all over Europe and even to America. Their concoctions have been honored in various prestigious events throughout Italy, including the famous EuroChocolate in Perugia (ooh, which I now see will be held on and around my birthday this year…hmm…). Golosia also operates as a restaurant, and the place itself is rather large with seating for 60 inside and another 300 outside–some nights there’s even a piano bar. Right, but you want to see the gelato, right? See those wafers in the “crema” flavor? They stick one of those in every cup or cone (two if you ask nicely). Pretty! Now, as you might know, I’m currently cameraless, so these shots were taken with my friend Carla’s camera–which had precisely 15 minutes of battery life left even though we were heading to a fun event (report coming soon! ); needless to say, I had to snap quickly and then close the camera, snap and close, snap and close. So these aren’t the greatest photos, but I think you get the idea. Since Carla was dolce enough to give me free reign with her camera during our adventure, I promised her a spot on the blog. Here she is enjoying a banana cone, which I highly recommend as the banana flavor is *so* good. All their fruit flavors are made with fresh fruit, of course, so there’s no weird artificial, medicinal banana flavoring going on here. I’m sure the guy in the background only thought I was a *little* weird for snapping and closing repeatedly. This visit I had a small cup of pistacchio (my staple) and “bacio.” For those who don’t know, bacio means kiss in Italian, but in the chocolate world, it’s a small candy made by Perugina with a hazelnut inside. That description is pathetic for just how good they are, but it’ll have to do until you can try one. Anyway, the “bacio” gelato is made with them and, whoa, is it chocolatey. And delicious. Especially with pistacchio. Yum. There is a small bakery downtown that makes and sells their own gelato. OH! It’s sooooo yummy! I like the chocolate, pistacho and lemon flavors. DIVINE! I never understood the pistachio fanatics until I tasted gelato…it’s also a staple for me and one I use to judge any gelateria! OK, proof positive that Blogger is wonky today–I received comment notifications from three other comments that aren’t here now–I had lots of trouble posting this as well, so I do apologize if anyone else is having difficulty commenting. I’ll wait and see if those comments reappear, but if not, I’ll post them later (they’re in my inbox!). Why do you write a post about gelati . I would die for a italian gelato . When you come to France , don’t forget to come with gelati ..OUps I’ve forgot it melts ..too bad. That gelato looks sooooo good! I am sad that I never had any when I visited Italy. I did have some when I was in Philadelphia earlier this year though! I have a place in mind that I would love to post about. But, I wouldn’t DARE go in there on a busy day as I don’t feel like getting elbowed trying to get shots of the gelato. It’s the tiniest of gelaterias I’ve seen, and people pack in there like sardines in a can! Sognatrice, I’ve solved the mystery of your missing commments…your post is in here twice, so those comments are attached to the other version of it, below this one! OH, and I don’t like ice cream, so I’d never tried gelato, thinking it was the same. I finally tried some last year, and boy was I ever wrong….LOVE gelato. Now I want some! Michelle, about your blog being wacky today – I see two of the same gelato post. I replied in one of them, and my comment is there along with a few others. I thought I’d pop over to this post and let you know what I’m seeing. Strange! Mélanie, so sorry! All the more reason for you to come and visit! -R-, I don’t think I had any the first time I came to Italy either. Oh wait. Yes I did, but only once. And I can’t even remember the flavor, so it couldn’t have been too memorable. Michelle only had a little cup, which was far less exciting than a cone–thus no photo. Plus I hate having my picture taken. Ack! I envy you. The gelato looks great. I want some!!!!!! The gelato looks delicious…and they guy in the background isn’t bad either! Christina, I don’t think it’s horrible at all, but I am a little sad to realize just how taken I am because I didn’t even notice that guy in person–only in the photo! Hehe… they made you work there! Not much else to say, but oh yum! That looks sooooooooooooo good. My favorite flavor is alla crema, mmm I can still remember chatting with cute little scugnizielli nnapulitani (there goes my pathetic attempt at typing in napoletano!) in Rome, with a cone of gelato alla crema in my hand. Needless to say, I went back again after I finished it and had the pistachio. And then the next day.. the coffee gelato. That all looks so good! Bacio gelato is my favorite and I haven’t had any in SO long (not since a business trip to Milano 4 years ago). And thanks for the link, I added you to my link list also! Straciatella (I think that’s chocolate chip over there) my favorite. My favorite tour yet, thanks!!! Karen, yum! One of my favorites too–although I can’t think of a flavor I *don’t* like…. Oh dear god, pistachio gelato. Just the thought makes me weak. I ate gelato every day I was in Italy. Sometimes twice in one day. LOL. p.s. I have already received my Bella Green Shopping bag. I’m still salivating at the thought of real live gelato!! Ohhh, ever have frutti di bosco? Wow. I’m with Audra – salivating and jealous – that you have access to such delights! Ashamedly, I have never tried pistacchio gelato but certainly will now. OMG…i am absolutely sure we were in the same place at the same time at least once a year if you were doing the CMN telethon – that was a staple in our Geisinger days! Witness, me too, and there’s no gelateria in sight. Drat! NYC, I personally think gelato is a perfectly acceptable breakfast, lunch, and/or dinner 🙂 And you got an organic shopper already? Woohoo! Palate, you *must* try pistachio. As Sara said above, it’s really a great test of a gelateria, although I’ve been lucky and had all tasty ones so far. Yeah, I’m going to have to get a gelato now…. Home made gelato and DQ in the same post! Gotta be some kind of big sin. I don’t mind a small or medium DQ cone in a rush. Small world as my Wife and Daughter just found a place that makes their own gelato about an hour from where we live. It used to be a used car lot that I passed daily on my way to work. Good improvement. I missed the special DQ day. :-/ (For some reason your blog wouldn’t load for me yesterday. The sidebar would, but the posts wouldn’t. Weird!) Oh well…. That gelato looks SO yum!!!!! Oh, yum. I haven’t had gelato in so long! Really ought to remedy that soon. Gil, I do love me some DQ, I can’t lie–especially the blizzards. Yum! And yes, from a used car lot to a gelateria is *definitely* an improvement! This is weird… I swear I left a comment a couple of days ago, but I LOVE the Bacio flavor! 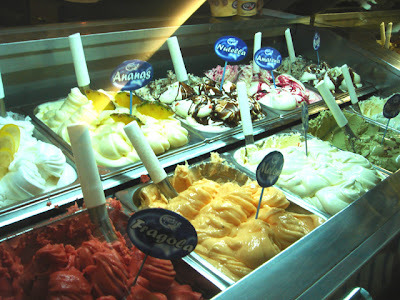 I so miss real gelato. I last had Bacio when I was in Germany a couple of years ago. I’m SO jealous reading this post! Jen, thanks for coming back to comment! There was an issue of a double post, so perhaps as I was deleting the duplicate, your comment was coming through and it got lost in the shuffle? Anyway, this sounds so good! 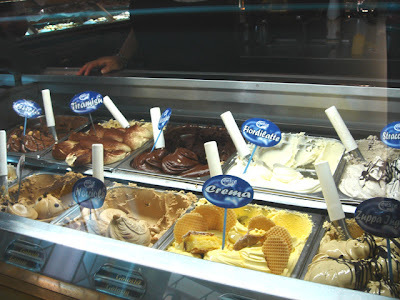 Roberto and I had Gelato yesterday – guess what kinds?? Pistachio and Choc. Hazelnut! I guess great minds think alike! Those would be considered our staples, although generally I prefer just plain nocciola, however it was not in the offerings yesterday! JennDZ, heh, well when you know what’s good, you know what’s good 😉 I had a tiny bit of nocciola last night…shh…. That’s just lovely. Really, really lovely. What is this knack you have for immediately putting me in a dreamy delighted mood? Oh wait… it’s your name/nature. Thank you lady, I quite enjoyed that. Brava for supporting the Childrens Miracle Network… I’m a huge supporter of that as well. I’ve done lots of fund raising for it, and it makes me grin to see you doing it from clear over there. Grazie Bella PSofK. This one kills me. 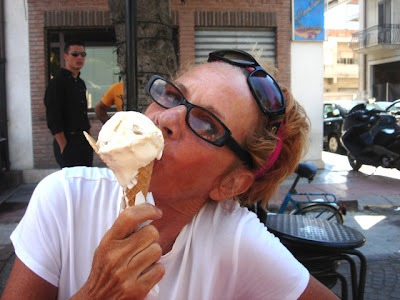 My two brief summers in Italy, I practically ate gelato daily. I too had my favorite spots near my rented house. It was hard to find bad Gelato in Italy. It is hard to find edible gelato in the US. I’m so jealous. This is so exciting, Michelle! Thank you for sending this link to me! I didn’t visit the Marina, only the hill top town of Gioiosa Ionica as that is where my husband was born, and where he still has relatives. We stayed in Siderno, where my husband’s sistter has a house, and swam in the Ionian Sea there. Such rustic areas, but so beautiful! And the food…….everythng so delicious and fresh. I loved waking up and smelling eggplant already being fried by all the women in the neighborhood for the siesta meal. It is so much fun to read a blog written by someone in southern Calabria! I am adding you to my blog roll and will be checking in frequently.